月光乱舞 shares multiple vocal samples with Love♡sicK, from SOUND VOLTEX BOOTH. A medley of 月光乱舞, Innocent Floor, 2 MINUTES FIGHTERS, The Sampling Paradise (P*Light Remix), and Sakura Reflection (P*Light Slayer Remix) appears as the GRAVITY chart of 月光乱舞. 月光乱舞 is featured in the TENKAICHI ULTIMATE BOSSRUSH MEDLEY, from SOUND VOLTEX IV HEAVENLY HAVEN. 月光乱舞 was added to SOUND VOLTEX III GRAVITY WARS on November 26th, 2015 as the SOUND VOLTEX Block Tournament Song of the 天下一音ゲ祭 全国一斉認定大会 2015 event. 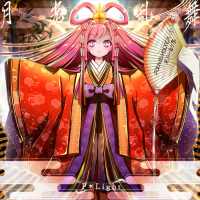 月光乱舞 is P*Light's first KONAMI original song in the SOUND VOLTEX series. RASIS appears in 月光乱舞's jacket and in the gameplay background. Before March 10th, 2016, Voltenizer Maxima from マサカリブレイド's jacket appeared in the gameplay background instead. RASIS now only appears while playing the GRAVITY chart. "Gekkou ranbu" (月光乱舞) means "wild dance in the moonlight" in Japanese. 月光乱舞 received a GRAVITY chart on February 20th, 2016, rated Level 16, at the JAEPO 2016 event for the 天下一音ゲ祭 全国一斉認定大会 2015 finals. It can be unlocked by all players from March 10th, 2016 via INFINITE BLASTER. This page was last edited on 19 March 2019, at 15:00.